Coca-Cola have once again provided a marketing campaign that combines experiential and digital elements to create an all encompassing strategy with a huge overall reach. The Choose Happiness campaign has been designed to encourage the older generation to take a leaf out of the youngsters books by deliberately "choosing happiness" within their life choices, as this is something that is apparently a new phenomena in society that older folks just don't quite understand! After a quick paced television advert was released showing what makes people happy at huge sporting events, music, and in life in general, Coca-Cola took to the streets of London (Brick Lane to be precise) to implement the experiential leg of the campaign. Here a giant pin board was constructed with members of the public being encouraged to write, draw or simply express what makes them happy on some paper in colourful markers. 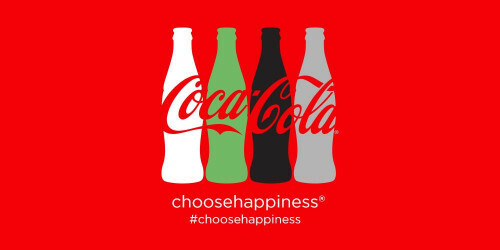 They were then given a ribbon and the opportunity to hang their declaration of joy on the huge Coca-Cola branded pin board wall, where photos and videos were taken and uploaded instantly to social media with visitors tagging and telling their friends of the #ChooseHappiness hashtag. Coca-Cola brand ambassadors were present throughout the activation providing a call-to-action, uploading images and videos to the various social media outlets utilising this hashtag. 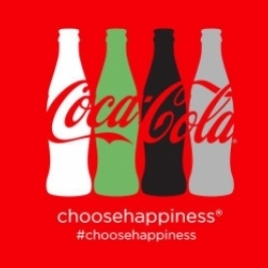 Coca-Cola set up a dedicated page on their website to accommodate the campaign which featured an eclectic mix of popular YouTube vloggers' #ChooseHappiness videos, details on the various Coca-Cola products, happiness infographics and lots of happiness-related case studies and celebrity endorsed images and videos. Hundreds of people turned out for the experiential event and the resulting hashtag was not only promoted by the 2.96m strong official Coca-Cola Twitter account, but was at the top of the Twitter trending list in the UK where the activation was based. Overall the reach of the campaign was amplified massively with the experiential leg of the activation being the starting point for this success. The connection of the live event with the use of TV, web and social media content meant that the campaign could reach its maximum potential and reach as many people as possible, providing an interesting talking point to spread the word about the campaign.